There are so, so, so many protein powders out there. And they all claim to be the best of the best! So, for this Food Fight, we’re letting two duke it out — FBE style. 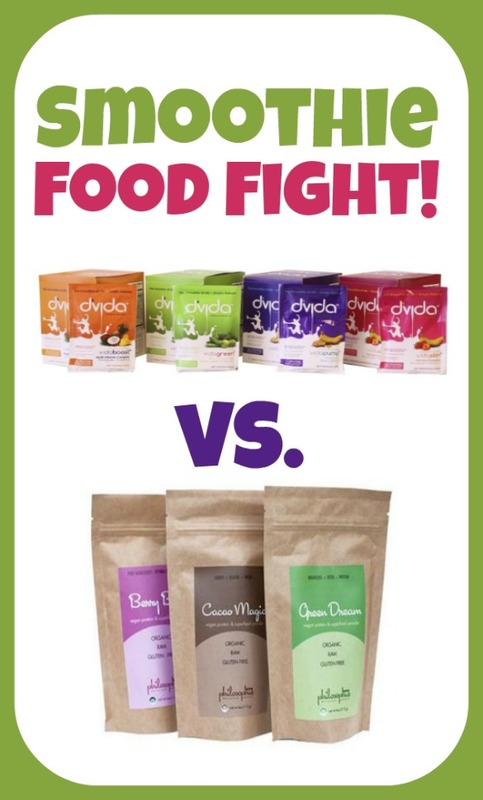 Say hello to the smoothie throwdown of the summer: D’Vida vs. Philosophie! D’Vida: All of the D’Vida smoothie kinds — vidaboost (Pineapple + Coconut), vidagreen (Cucumber + Kale + Green Apple + Spinach), vidaslim (Strawberry + Banana), vidapump (Banana + Peanut Butter) — are really easy to blend up with even just water and give you a pretty smooth-textured smoothie, which is nice. They taste more commercial, too — kind of like something you’d get blended up at Smoothie King. All are sweet with lots of flavor, but vidapump was definitely my favorite (the least sweet and most natural tasting), followed by vidaslim. I found vidagreen to be too sweet for how green tasting it was (would have preferred the cucumber to come through a bit more), and the vidaboost was really, really coconutty (would be good for a pina colada smoothie twist though!). Philosophie: I feel like a broken record with how many times I’ve said that I’m not a huge fan of overly sweet smoothies or snacks. But I have to say it again because Philosophie hits that delicate balance of being flavorful and fruity without tasting like candy or giving you a sugar rush. And while I found that you needed a decent amount of liquid and a really lengthy blend to make sure the powder was fully mixed and not gritty (just had a hint of grit for me a couple times — not terrible but of note), these tasted really good. The Berry Bliss was subtle yet fresh, the Green Dream definitely had a more natural taste to it but was still good, and the Cacoa Magic was my favorite with lots of rich chocolaty flavor. Winner: This one goes to Philosophie! Although D’Vida does have a better texture than Philosophie, I just can’t get Cacoa Magic out of my head it was so tasty — and with just the right amount of sweetness. Philosophie takes it! D’Vida: The nutritional facts on the vidaslim and vidagreen one-package serving (comes in handy single-serve packets) are 130 to 140 calories with 3 grams of protein, 5 grams of fat, 7 grams of fiber, 22 to 25 grams of sugar. The vidapump and vidaboost kinds have 240 to 260 calories each with 15 or 20 grams of protein, 8 or 13 grams of fat, 7 grams of fiber and 24 to 25 grams of sugar. All of the flavors are packed with vitamin C, calcium and iron. Philosophie: A one-tablespoon serving of Philosophie has between 55 to 80 calories with 10 grams of protein, 1 gram of fat, 2 to 5 grams of fiber and only zero to two grams of sugar. They’re also full of all kinds of vitamins and minerals like iron, vitamin C and calcium — but it’s not added in. Those vitamins and minerals just naturally occur in their blend of superfoods. Like whoa! Winner: Philosophie wins it! It’s hard to beat Philosophie’s low-sugar, low-calorie high-protein blend (even when you double the serving size so Philosophie and D’Vida have equal serving sizes) — plus we love how the vitamins and minerals come from whole foods! D’Vida: The protein in these come from whey and while there are some really good ingredients in there — shredded coconut, freeze-dried organic kale powder and freeze-dried banana powder, there are also a lot of really big words you can’t pronounce on there. Ones that don’t come from the earth. Granted, some of them are basically vitamins and minerals (like you’d find in your everyday multivitamin), but there are still some suspect ones and vidaslim has a whole fat-loss blend (guarana, hoodie, yerba mate) that kind of sounds like a Dr. Oz episode. They do have stevia as a sweetener though, which is nice. Philosophie: Protein-powered by either hemp powder or sprouted brown rice protein powder, these are gluten-free, all-natural, gluten-free, organic and fair-trade. Not to mention that the ingredient list features TONS of superfoods like maca, goji berries, chia seeds and spirulina — plus countless others. No dairy or animal products either! Winner: Philosophie wins it again! When the only thing on an ingredient list that you can’t pronounce is actually a superfood and not a preservative, you know you’re doing it right! Philosophie! When it comes to a clean super-good-for-your protein powder for your smoothies, you can’t go wrong with Philosophie!